How far would you take it if you found out your spouse was cheating on you? If you have ever been with a cheater, you know the desire to expose that person is too real. 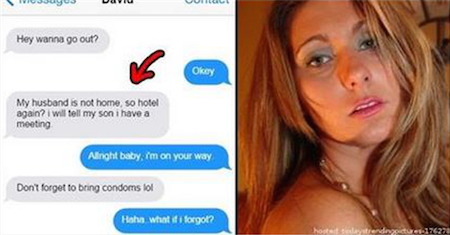 This genius husband thought up the perfect scheme to expose his cheating wife. “So I had a feeling she was cheating, as she set off a lot of red flags. Constantly laughing and smiling when texting, saying it was just her mother when I asked. Needing to stay late every night after work. When I would call in, her coworkers said she left hours ago. When I asked her what was going on she laugh it off and say it was just something they did to each other at the office all the time. Fast track to her birthday, several months down the road. Now I know what you’re thinking, why the hell did I wait months before I confronted her and did it really need to be on her birthday? The answer to the first question is I wanted as much evidence as possible to hand off to my lawyer, as well as time to make arrangements to find a new place to live, etc. The answer to your second question is – of course it had to be on her birthday. You see, after asking her what she wanted to do on her birthday this year she was rather insistent on me going out of town with my friends as she just had to work anyway and didn’t want to be reminded she was aging. So I know something is up and after finding a bottle of champagne and two glasses hidden in my closet something in me snaps. So I do what any sensible man would have done. I leave and go to my friends house pretending like I’m going out of town. While there I call up her mother, father, sister and several of her friends. I tell them how I want to give her a big surprise by sneaking into our room with party streamers, kazoos and a big cake with candles. Sounds fun, right?! Well, boy it was. I had everyone meet me outside our apartment at 8;30 in the morning. We all pile in the elevator, about eight of us total. Her mother is holding the cake and I’m reminding everyone to be as quiet as they can be. I put my key in an unlock the door. We all sneak in and make our way down the hall towards the bedroom. Each holding a kazoo and her mom holding the cake grinning from ear to ear.